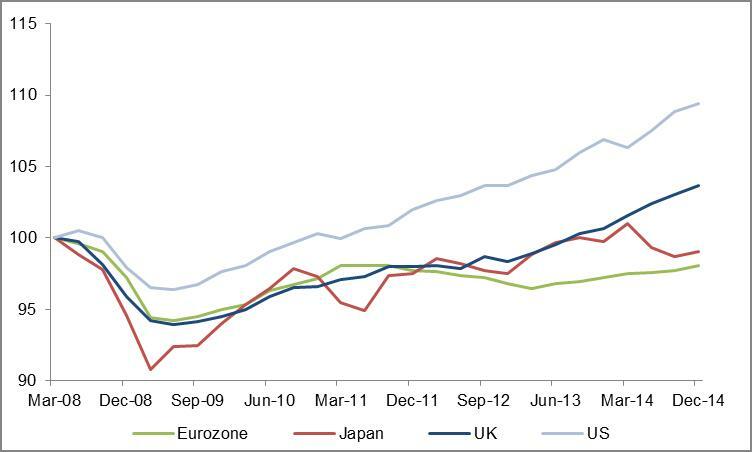 The cyclical and monetary policy divergence argument, which pivots around the idea that the US is far ahead in the cyclical recovery compared to most other advanced economies (as illustrated in chart 1), has clearly been a key powerful driver for the USD, leading the broad USD index up more than 10% over the past year. The building blocks under the view of potential for USD gains to extend over the medium term, though, go beyond purely cyclical considerations. A number of structural factors underpin a constructive view on the USD. 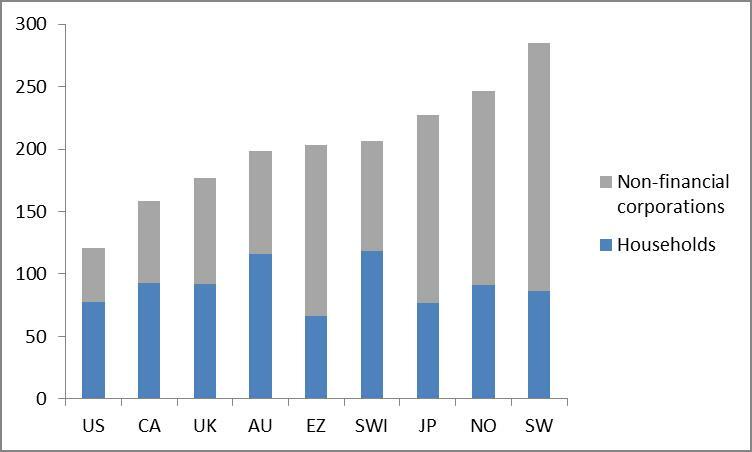 The US has in fact one of the highest potential growth among advanced economies: among a handful of advanced economies with growth potential between 2-2.5% according to OECD estimates. This is backed by solid trend productivity growth, which, despite the lousy performance since the 2008 financial crisis, remains the strongest in G10 since the turn of the century (Chart 2). After suffering from a period of private sector deleveraging in the years after the financial crisis, the balance sheets of US households and corporates are now in much better shape and aggregate private sector debt stands out as the lowest among advanced economies (Chart 3). Fiscal accounts have also been improving rapidly (the fiscal deficit was only 2.4% of GDP in Q4 2014), driven by a steady rise in receipts at broadly steady expenditure levels. Longer term fiscal challenges though remain, mostly linked to social security reform and the consequences of an aging population, with the IMF estimating the US fiscal gap among the highest in G10. 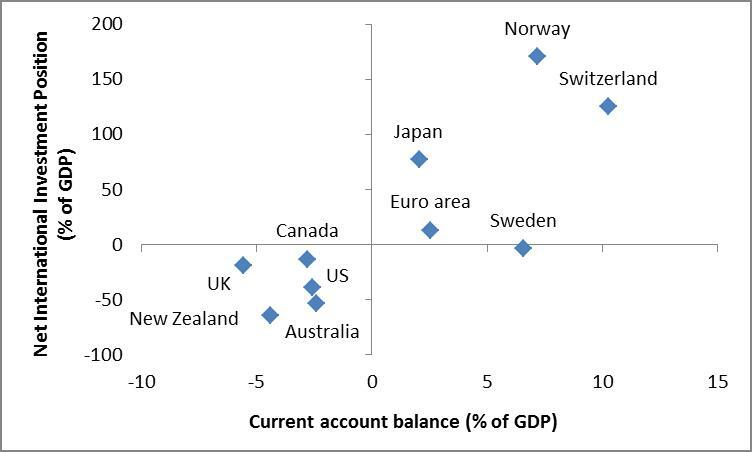 While as Chart 4 illustrates the US is not currently in a particularly favourable position as far as external balances are concerned, given its current account deficit (ca 2.5% of GDP) and negative IIP, there are certainly reasons to believe the external position ought to improve going forward. From a current account perspective, the US is set to benefit from the ongoing energy revolution: energy self-sufficiency seems in fact achievable over the medium-long term (Chart 5), with obvious positive impact on the current account deficit (estimated around 1% of GDP). Furthermore, after years of disappointing flows, the capital account should benefit from both Fed normalisation and structural attractiveness of the US in terms of FDI destination (e.g. 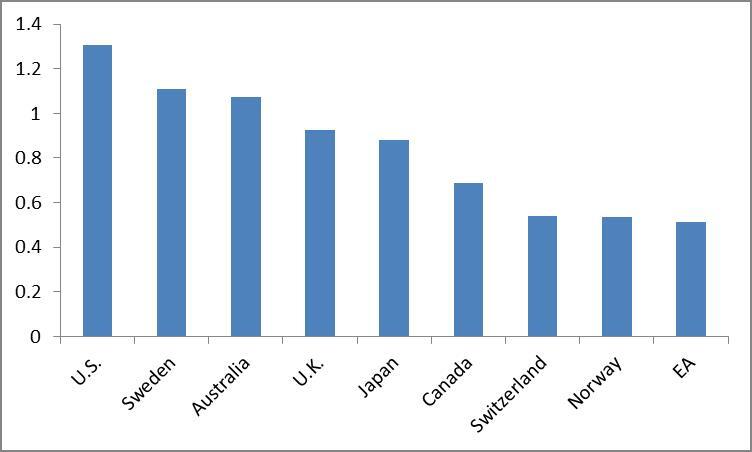 US tops the World Bank ease of doing business ranking among major advanced economies). Lastly USD could find sources of support from more technical drivers. 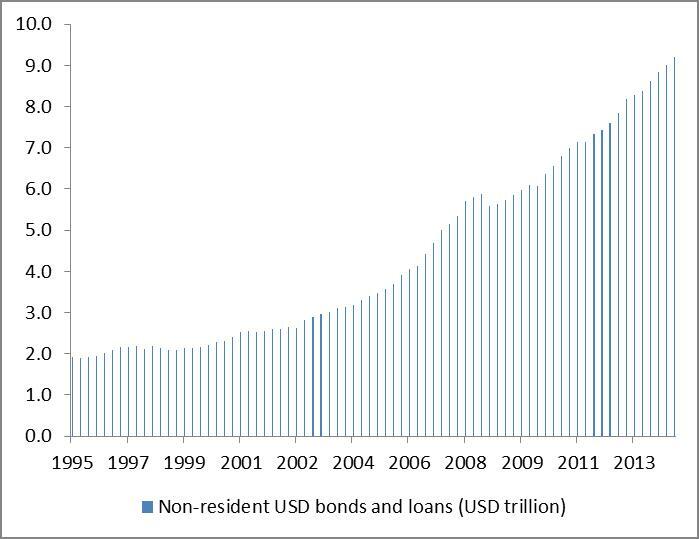 One argument is that after years of easy Fed policy, with households and corporations abroad having borrowed heavily in USD, USD non-resident debt overhang is now at record highs (USD bonds and loans outside the US now stand at USD 9 trillion, up about 50% from pre-crisis levels according to the BIS – Chart 6). Furthermore, following years of diversification, central bank reserves may start to re-pivot around the USD, fuelled by negative yields across Eurozone fixed income markets and EM central banks reserve reallocation towards dollars to re-build FX intervention ammunition. Unwinding of USD short positions and renewed central bank reserve reallocation would therefore add to USD positive flows. Source: Haver, as of April 22nd, 2015. Source:, Haver, as of April 22nd, 2015. Chart 5: Energy revolution to support US current account adjustment going forward. Source: BIS, as of April 22nd, 2015. This document contains the views and opinions of Mattia Taboga and does not necessarily represent the opinions of Millennium Global Investments Limited or the funds/accounts it manages or of any Portfolio Managers.